Not! White Christmas is what we want but here is Texas we got 75° Christmas. It just felt so wrong…Christmas with flip flop on and short sleeve instead of sweater and boots. Welcome to Texas!. Though, growing up in Jakarta, Indonesia where it is 80° to 95° all year long did not feel the big deal of having a warm Christmas, yet it felt wrong here yesterday. Every year I felt like Christmas snuck up on me. Every single year. Specially this year. I have present that I ordered and did not get in time. 2 shipments. Thank God I have enough for everyone. The good thing was they seemed to be happy with what they got. My kind of shopping is not to pay full price. But getting a good quality items. Most of the stuffs I purchased, took a long time for me to actually made my decision to buy. I have to do research and comparing reviews and price, my husband word was I studied everything first before buying and that’s including menu at the restaurants. The results, most of the stuffs I bought last so long that make it hard for me to replace and buy a new one as long as it still works. That’s an ouch moment sometimes. Like for example the Instant Pot. My friend had told me about it 3 years ago and I just finally got one last year. And that was the best thing ever. And when I love something that is as good as that products, I tend to sell them, not that I am selling that, but I share assn convince people to get it. I won’t do that unless I am very sure that it is good. That how I work in my 8 to 5 job too. That being said, head on to my shop with me section. I have stuffs that I use and like in that link. As I buy stuffs, I will add it on to that link so that it will be easier for you to check the products I love. Working in my line of work, as crazy as it is, I enjoy the benefit that I can purchase things at cost and that definitely helps my Christmas shopping. And not helping when I go out shopping at retail. Hard for me to buy stuffs as I know the cost of the products out there at retail stores. Another ouch moment. We had a good time despite the 77° situation at my mother in law’s house. I got stuffs that I need. We can’t never have enough of spatula, measuring cups and spoons right? And the silicone holder I have been eyeing for quite some times lol and still on my considering list. My sister in law who just got and love her Instant Pot got it for me. While my hubby got me the extra rings. I am happy with what I got. I think Santa actually sees that I have been a good girl after all. My son got what he always wanted for his room. A bigger screen TV. He had the 19″ for years and actually it bothers me more than him. So small it’s hard for me to watch from his bed. Yeah I sometimes got booted out to watch my show in his room because my hubby watch in our bedroom and my son play games with his friend in our living room. So I personally think he needs a bigger screen. There I went searched and researched. Took me a little over a year…we finally decided to get it after I got visa gift card from my boss for Christmas. Headed to BestBuy. Looked around and still debating in size around and brand. Finally I grabbed the salesman and asked for the brand I want which I checked online that we wanted to get. Of course they don’t have it but can order it for us. Just not gonna be on time for Christmas. Then I asked what they have available for the open box. He took us there and there’s not many options but they do have a bigger one that we originally planned to get. Tested the TV and we are happy with the quality and paid for almost half of the regular price. Can’t beat that, plus the no hassle of opening the box as we got home literally plug and play lol. Well had to hooked up all the other stuffs like the cable and the Xbox. It was awesome..now my lil man has his preteen cave. 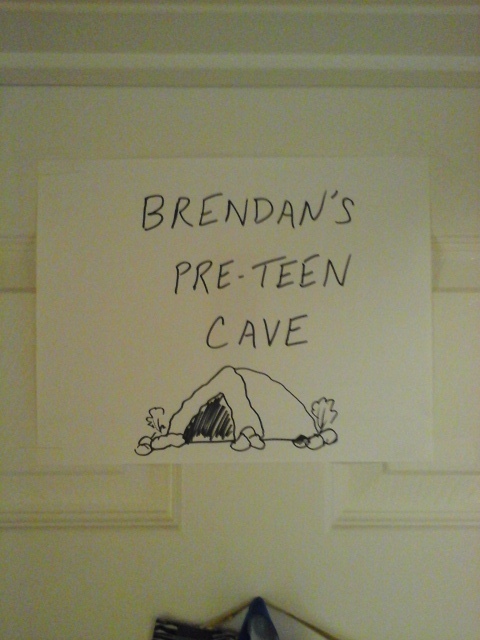 Yepp we made a sign for his bedroom. Now to the belly part. We decided on ham after having turkey for Thanksgiving. Last year I killed my ham using the crock pot method. Never again using crock pot for ham. Nobody complained last year but when I mentioned it this year how I killed the ham last year, I saw nodded head lol. This year, no more killing the ham. I am using my Instant pot for that. Wrapped the ham in brown sugar and cinnamon then in foil. Into the pot on the rack with 2 cups water. Manual high pressure for 15 minutes and let it sit while releasing the pressure naturally I did let it go in warming mode while I am finishing up with my other dishes, it was 45 minutes. Not dry, it was really moist ham we had yesterday. Unlike the crock pot version last year. Made the mac and cheese also in my other instant pot. 4 minutes cooked my 16 oz macaroni with 4 cups of broth, salt pepper, nutmeg, 2 tablespoons butter, when it was done, I added the milk and heavy cream and the cheeses. I like using sharp cheddar, white cheddar and parmesan. Then pour them in the dish and topped with panko bread crumb and parsley. Dotted with butter and baked in 350° until golden brown and bubbly. Pork and apple are best friend. So we decided on cinnamon apples for the ham. I peeled, cored and sliced, not too thick and not too thin, 6 gala apples, soaked them in lemon juice as I work with them. Toss them around making sure all coated with the lemon juice. Then add 2/3 cups brown sugar, 1 1/2 tablespoons corn starch, a pinch of salt, 1 teaspoon cinnamon and 1/2 teaspoon nutmeg. Toss the around by flipping the bowl to distributes the dry ingredients evenly. Pour in buttered dish , dotted with 3 tablespoons of butter, baked in 350° for 30 minutes. This is good to be served with vanilla or cinnamon ice cream too. The lemon juice balanced the sweetness of the brown sugar. It was perfect. Who doesn’t like Red Lobster cheddar biscuit? Anyone? My family love them. So I am making them today. I used 3 cups flour, 1 1/2 tablespoon baking powder, 2 tablespoons sugar, 1 teaspoon salt, 1 tablespoon garlic powder and 1 1/2 stick of butter, mix them in the food processor until crumbly or like I did yesterday, sitting on my couch binged on Netflix and used 2 knives. Then I add 2 cups grated sharp cheddar and 1 tablespoon dry parsley. Last pour in 1 1/2 cups milk and mix with spatula until just moist. Do not over mix the batter. Use ice cream scooper, drop them onto parchment lined baking pan. Baked in 350° for 15 minutes. While it is baking, melt 1/4 stick of butter, add 1 tablespoon dry parsley and a pinched of salt. Use the mixture to brush the biscuit right after it’s out from the oven. My hubby and brother in law were raving about these biscuits. My sister in law made tamales. She made a lot of them. It was vegan tamales as she is turning japanese, no I meant turning vegan. It was bean with salsa verde. Had a little kick to it but not much. She doesn’t like spicy food. While her husband does. It’s the other way around with me and my husband. I love love love spicy food, Sriracha is my best friend whilst it’s his enemy. Isn’t that weird? Lol not really. Dessert was banana pudding and cherry crunch. No I didn’t make those. Oh and devil egg was on the menu too..not for dessert though. Went home happy and tired last night. But I still binged on a new series…like what I am doing now while typing. I am a Binger! Merry Christmas everyone, hope you all had a a wonderful time with your family and friends.